Before November 8 the record daily average for the Dow Jones was set on August 15. Since Trump was elected, the Dow Jones closes at record highs 7 of the last 11 days. On Wednesday night, the Dow closed at a new high of 19,082. This was the 3rd day in a row of setting a new high. Obviously, this up tick in the Dow Jones has happened at the same time that Donald Trump was elected president. 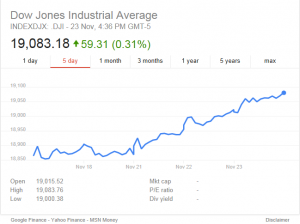 It will be interesting to see how high the Dow Jones can go during the holiday season and moving forward into the beginning of the Trump presidency.